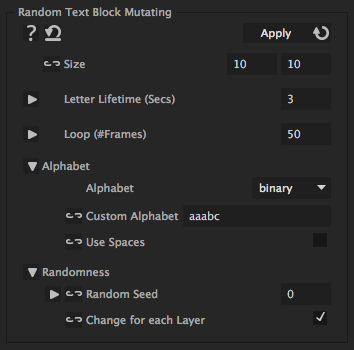 This iExpression replaces the source text of a text layer by a randomly generated text block of a given number of rows and columns. Different kinds of text can be generated, e.g. binary numbers, numbers, or random strings using the letters of the alphabet. The random text mutates over time, i.e. individual letters change spontaneously from time to time. The created animations are loopable, i.e. after a given number of frames, the text is again the same as it was at the first frame. How many letters the text block should be wide and high. For 25, the same pattern repeats every 25 frames. The shorter the loop, the faster is the computation.